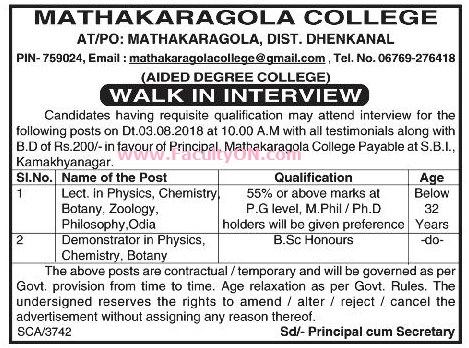 Mathakaragola College, Dhenkanal has advertised in the SAMAJA newspaper for recruitment of Lecturers / Demonstrator jobs vacancies. Interested and eligible job aspirants are requested to walk-in on 03rd August 2018. Check out further more details below. About University: Mathakaragola a land of Matha & Mandir surrounded with eco-friendly atmosphere blossomed with a college on 7th July 1987. The college is permanently recognized by the Higher Education Department, Govt. of Odisha and affiliated to CHSE(O) and Utkal University, Bhubaneswar. The college imparts teaching in Arts, Science, Commerce & Vocational at +2 level and in Arts & Commerce at +3 level with Honours facilities. Other facilities like Library, Reading room, Computer class and Laboratory are available. The college is registered under section 2(f) & 12(B) of the UGC Act. 1956.